Look at the picture. Why do Andreas and Maria go to their neighbour's house? they have no crockery. They want to ask their neighbour if they could borrow some crockery. they have a little dog and want to show it to their neighbours. they are moving back to Germany and want to say good-bye. Listen carefully for the details about the house-warming party. Then answer the questions below. It starts at 3 o'clock in the afternoon. It starts at 5.30 in the afternoon. On what day of the week is the party? The party is on Friday. The party is on Saturday. Andreas' colleagues will come to the party. The neighbours of the Fernandez family will come to the party. The party is at the Fernandez's new home. The party is in front of the school. When the workers and the removal van leave, Maria talks to Andreas. How could they forget the crockery? Now we don't have anything to eat with! Calm down, honey. 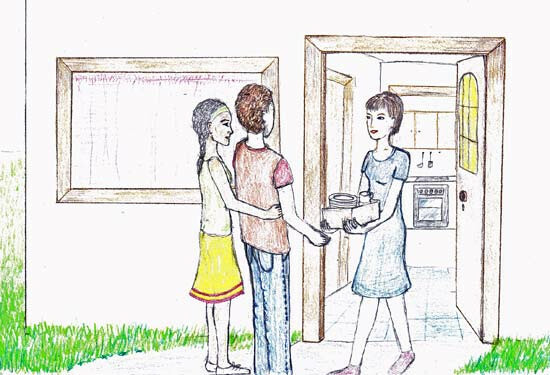 Why don't we ask our neighbours to lend us some plates, knives, forks, spoons and cups? Good thinking! It will give us an opportunity to introduce ourselves! You know what, let's have a house-warming party this Saturday! We can invite all our neighbours. They walk to the neighbour's house and ring the bell. A woman opens the door. Hi! We're the Fernandez family. We're from next-door! My name is Maria. Oh hi! Nice to meet you! I'm Betty. Nice to meet you too, Betty. I'm Andreas. Betty, do you have some spare crockery? Sure, I do. Do you need some? Yes, please! The removal company forgot ours! Sure, no problem! Just a second. She goes inside and comes back with a box full of crockery. That's so nice, thank you! Betty, would you like to come to our house-warming party this Saturday? Around three in the afternoon. Can I bring something? A salad maybe? Yes, please! That's so nice, thank you! Complete the sentences below. Choose the right words. comes up with the idea to have a house-warming party on the weekend.